Hey, all! 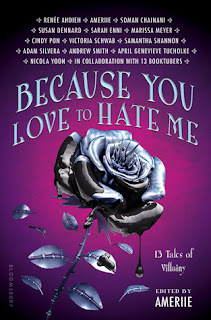 Have you seen the cover reveal for Because You Love to Hate Me, edited by Ameriie (the YA villain-themed anthology that I am participating in)? Check it out below the cut! You can find out more information at the original EW cover reveal post (i.e., more on Ameriie's perspective on villains in her introduction to the anthology!). In the meantime, let's ogle this cover and its beautiful details. (Click on the image to see it in its high resolution glory). A.) The black blood is going to be 3D and shiny! B.) SWORDS ARE THE STEMS OF THE LEAVES! Or daggers. Sharp, deadly things! C.) There is a crown at the bud of the rose! D.) The title is going to be shimmery foil! E.) At the base of the rose, the stem looks metallic and reminds me of the future or clockwork-type things (steampunk? I have no idea, but I am admiring the detail). 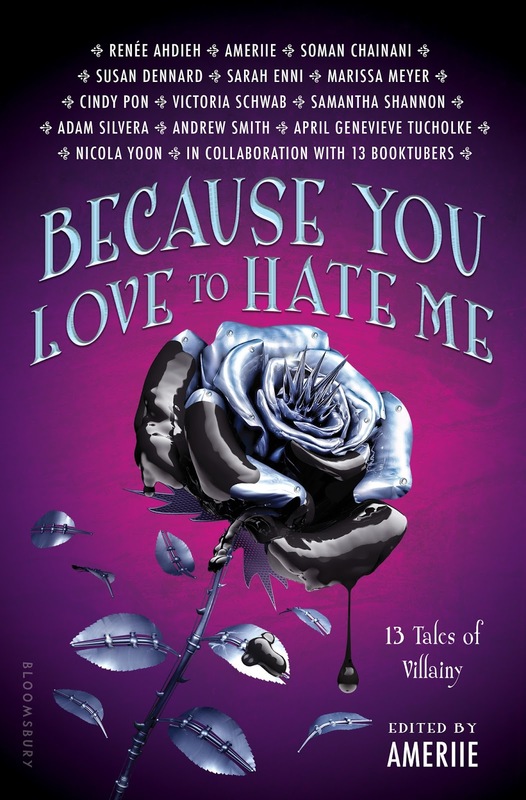 F.) The rose, dripping with black blood, is such an iconic symbol for fairy tale-ish villainry; the anthology is not limited to fairy tale villainry, BUT how else will you represent so many diverse perspective on villains without revealing who those villains are? (The design challenge of a lifetime-- and this designer clearly won. LOOK AT THE GORGEOUSNESS). So proud to be a part of this project! You can add the book on Goodreads. What do you think of the cover? Are you pre-ordering the book/what are you most excited about? What do you think that the back cover will look like? Let me know!